Ever since your child came into your life, you knew that he was destined for great things. Not the normal great things either, mind you. Your child was destined to become a super-awesome robot, a Transformer if you will, to fight giant evil robots. Now, we know what you’re thinking. What can I do to help my child become the greatest robot in disguise that ever lived? Well, there are plenty of things you can do. For starters, you can teach him all the great Autobot catchphrases, like “Roll out”. Of course, you could even study advanced robotics in the hopes of fully transforming your child into a robot in disguise, but that technology seems like it’s way off in the future. We happen to think this licensed Bumblebee child costume is a much better alternative to that. 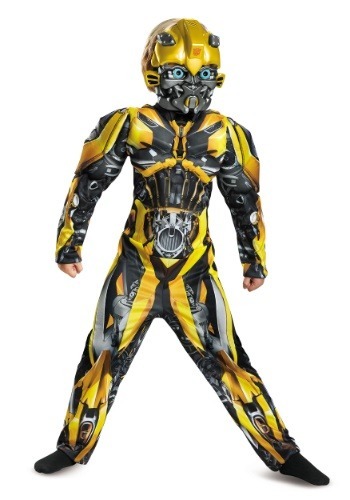 This Transformers kids costume comes with everything you need to help your child become the greatest Autobot of them all! It’s based on the latest movie and has a yellow and black jumpsuit with printed details on the exterior. The mask is molded to look like Bumblebee’s face and it even has the Autobot symbol on the front. Just remember that once your child has it on, he’ll need a little bit of guidance to beat Megatron! You’ll have to be his robot mentor, so you maybe even want to consider picking up an Optimus Prime costume of your own to become the greatest robot duo to even hit your neighborhood! Just a thought for you!